You might have been making music for years or perhaps you just got started. You’re struggling to make the music sound like you want it to. You feel like something’s missing. So you listen to other people’s music, you start comparing, and suddenly, you think your music doesn’t sound that great anyway. You start thinking that it may be pointless to make new music. There will always be someone who makes music similar to yours. The chords, notes, tones, drum beats, ... you use, have been used before. So why do you make music, if it seems like it’s all been done before? Does this sound familiar to you? 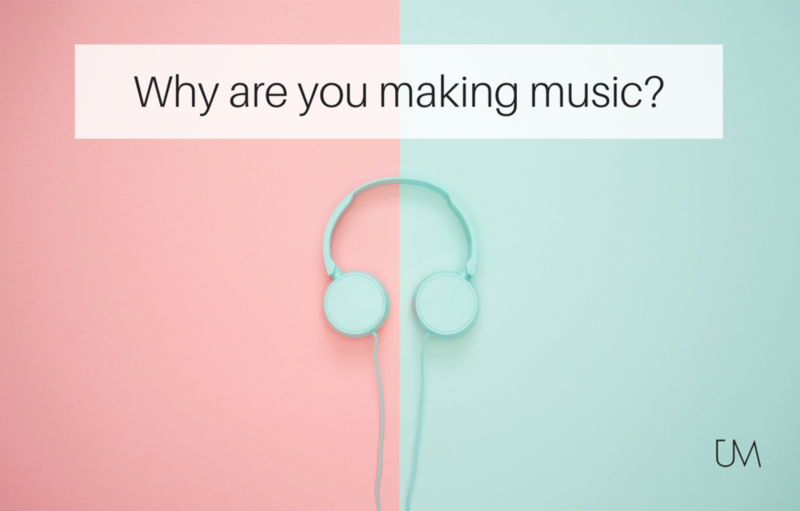 Do you know why you are making music? The answer to that question might seem evident, but is it really? For the love of music - what do you want to achieve? You might say that you make music for the love of music, or for yourself, or because you HAVE to, or because you’ve been at it since forever and that’s just the way it is. But do you really know what drives you to produce? What is your goal? What are you hoping to achieve? Do you do it for self-expression? For self-healing? You couldn’t be bothered if other people listen to it or not? Do you want to get noticed or become famous? You want to showcase your skills and be the best? Do you do it for fun? Or just because it makes you feel good? Is it for the money? Or to earn respect? Status? Do you want to have a cultural impact? Is it because you want to perform live in front of a crowd? Or you want to land a record deal? The list can go on and on. The point is, what are your goals? What are you hoping to achieve? Goals give you a sense of direction in your life. And while it’s not always easy to achieve your goals, once you do, it brings a great sense of fulfilment and joy. But really, if you think of it, if your goal of making music is to get noticed, to earn money, to express yourself, to get respect or status, those are all just goals that stem from underlying values. A goal is an outcome of a value. A few examples of values are positivity, joy, respect, freedom, creativity and confidence. If you’re unsure about what value lies behind your goal, that’s where the answer to your WHY lies. Your values are the essence of that you wish to achieve. Even more so, you’ll unearth the basic needs behind it, which are love, belongingness, esteem from others and self-esteem, safety and self-actualization. For example, if you make music for the money, it’s not really for the money, is it? It’s because you want stability, safety and freedom to do what you love without having to worry about anything else. Without the stress of not being able to pay the bills, live in your home and have a full fridge. Stability and safety are basic needs. Freedom to be able to do what you love is a form of self-actualization. Now, you already know how you’re making music, and perhaps also what you’re hoping to achieve. If you don’t know what you’re hoping to achieve, that’s usually the point where you’ll feel stuck, start to doubt yourself, and struggle with your creative process. The thing is if you’re familiar with Simon Sinek’s “Golden Circle”, you know that 'the how' and 'the what' is not so important if you don’t know 'the why'. And if you don’t know why, why should other people care? Not to sound harsh, but if you don’t know why you’re doing what you’re doing, you can’t expect your fans, record labels or venue promoters to care. If they don’t care, you’ll probably wonder why! How does that make you feel? Do you start to doubt yourself? Do you instantly want to know what’s wrong with your tracks and WHY they don’t want to release it right now, even though they were quite positive about your work in the past? It all comes down to what values drive you and what you’re hoping to achieve. If you’re feeling overwhelmed right now, know that you can figure all of this out and you will feel a much greater sense of purpose, you’ll feel more confident and excited about your craft! Are you afraid nobody will listen?